Toast & tea - the perfect combination! Ha! That is just to cute. Make me want to set my glass on a piece of stale bread. Ahhh! I so obviously don't need them, but want them so bad! Adorable! Liz, somehow I don't think that would work quite as well. Ha! Brilliant! I love collecting coasters as well, though we never seem to use them. lol those are too funny and cute! i was just thinking earlier today that coasters seem like such FUN collectibles, and this confirms it! any chance we can purchase some super groovy mugs like the one in the pic? These are so fun! Thanks for sharing them with us! These are hilarious, but there's part of my brain that is stressing out about them - they're too real! AWESOME. And kind of reminiscent of my mother's toast. I love those! I didn't even know that there was a MoMa online store. There are several neat things there. Thanks for sharing! So they are coasters in the shape of toast, does that make them......toasters? Those are great! I love the links you share. That WAS being smart! Museum of Modern Art-worthy! You should feel complimented! 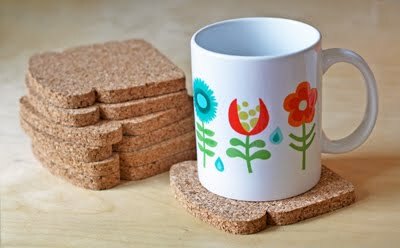 Those ARE cute, and so is the mug! I am in love. Those are adorable. AND they're gluten-free! These are amazing! Sooooo cute!! I MUST have some for the office!! I still think you should somehow sell that mug!! Clever, fun and functional -- the perfect combo! These are so funny!!! I just love them! These are adorable! I just shared your post tonight on my Friday Favorites post and they are already the favorite item I've posted. : ) Thanks for sharing the creativity! how thick are they? the product page doesn't say. You should call them toasty coasties! HA!